Public transportation is a key factor in the growth of an economy. Trains and trams are both rail-borne modes of transportation consisting of a series of coaches/carriages/vehicles. The rails guide and support their wheels through the tracks. Their flanged iron wheels are designed in a way that they can easily turn corners without slipping off the tracks. Trains and trams appear to be similar; however, each is different from the other, starting from the mode of power they use to the length and weight. Still, the difference between these two is getting less distinct. With time, each is being modified in search of efficiency in operation, and the similarities to each other are increasing daily. These new creations are called train-trams and tram-trains. A “train-tram” is a modified train that can run on tramways. A “tram-train” is a tram that runs from a tramway to a railway line. It has also been modified to have the speed of a train. Trains are called trains everywhere and can be found in all countries; hence, they are viewed as an indispensable mode of transport. They are known as heavyweight transport systems. Trams have various names depending on the country where they are found. They are also called light rails, tram cars, street cars, and trolley cars. They are classified as lightweight transport systems. They can be reversed at the end of the run depending on whether the tram is single-ended or double-ended. Trams are modern, hence, are only found in developed countries. Below are comparisons between trains and trams. Trains are longer and have more carriages and coaches than trams, hence, hold more capacity. Trams are shorter and lighter as compared to trains and have fewer coaches and carriages. The track beds and rails built for trains are from heavyweight iron in order to support the train’s weight. The tracks are also a few inches above the ground and are called railways. For trams, the rails are lightweight so as not to damage or collapse the roads that they run along. They are also built on the same level as the road, hence, offer easier access to disabled passengers. These rails are called tramways. Trains are found outside the city limits. They are long-distance means of transport, hence, are very fast and do not share their space with other means of transport. Some trains exclusively transport passengers, some are freight trains, and others transport both passengers and freight. 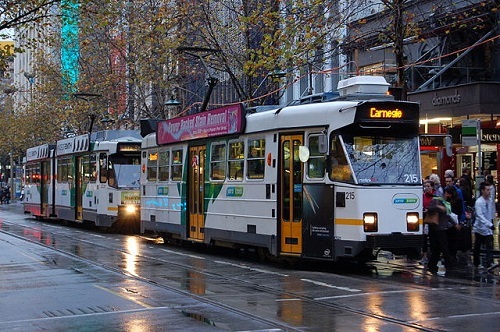 Trams are developed in urban areas within the city, and most transport passengers exclusively. They are used for short routes intra- and inter-town, hence, are not as fast as trains. The distance they cover is shorter than the train’s but longer than the one covered by buses. They share the road with buses and cars, so they have to stop and give way to other means of transport. Trains travel long distances; therefore, their stops are at least a kilometer apart. For trams, the stops are every few yards, meaning they can be similar to bus stops and are not separated from the community. Hence, they appeal to commuters as a mode of transport. Trains used to be coal driven and then became steam powered. But in recent times, engineers have developed electric trains. The majority of countries, however, still have steam-powered trains. Trams initially were animal-drawn carriages, but now most of them are electrically powered. Others use diesel, and some use both electric and diesel. Sarah Waithera. "Difference Between Trains and Trams." DifferenceBetween.net. January 11, 2016 < http://www.differencebetween.net/miscellaneous/difference-between-trains-and-trams/ >.